What is SimplyCast Landing Page Generator? 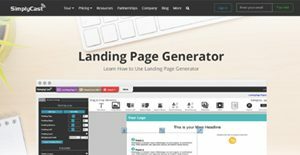 SimplyCast Landing Page Generator is a landing page designing and publishing solution that allows businesses to connect with their customers more effectively through landing pages. It allows easily creating landing pages that help engage customers and convert leads during special promos, events, campaigns and contests. It helps businesses discover the content/CTAs that increase engagement and drive conversions. The solution makes it easier to organize leads by automating scoring, list-segmentation and tagging. The platform offers more than 15 communication channels to effectively communicate with leads, including SMS, email, fax and voice. Users can accomplish a variety of goals, including managing subscribers and automating various tasks using a single platform. The solution includes everything users need to create beautiful and engaging landing pages and also allows business to integrate PayPal payments directly into the landing pages. The drag-and-drop editor allows users to effortlessly create professional landing pages in very little time. It also does not require the user to be familiar with web languages as users can accomplish everything using functional elements needed to build engaging landing pages. Social media elements can be easily integrated to further extend the reach of landing pages, while visitor interaction can also be enabled. A/B split testing allows businesses to test drive different content and designs. Visitors can be sent to specific landing pages for a more targeted and personalized experience. Targeting not only offers very relevant information, it also helps boost interaction and conversion rates. Support for custom domain allows businesses to make their landing pages appear as if they were hosted on an official site, which results in improved brand consistency. This also results in improved engagement, brand recognition and loyalty, which are essential elements of a solid marketing strategy. Targeting at a personal level allows companies to send highly targeted and personalized content as landing pages provide a great platform to collect personal information of customers after each lead. Businesses can use this personal information to create messages that target customers at a more personal level. The heatmap helps discover where visitors click the most and how they interact with a page. Simply Cast supports integration with PayPal and allows businesses to make a trusted payment option available right on the landing pages. If you are considering SimplyCast Landing Page Generator it could also be a good idea to analyze other subcategories of Best Landing Page Software listed in our base of B2B software reviews. It is important to note that almost no service in the Landing Page Software category is a perfect solution that can match all the requirements of various business types, sizes and industries. It may be a good idea to read a few SimplyCast Landing Page Generator reviews first as some software might dominate just in a really narrow group of applications or be created with a very specific industry in mind. Others may operate with an intention of being easy and intuitive and as a result lack advanced functionalities needed by more experienced users. There are also software that focus on a large group of customers and give you a rich feature set, but that usually comes at a more significant price of such a service. Be certain that you're aware of your requirements so that you pick a solution that has all the features you look for. How Much Does SimplyCast Landing Page Generator Cost? SimplyCast offers different enterprise pricing models for enterprises, small-medium businesses and startups. The basic package does not include A/B split testing, unlocked traffic strategy and subdomain masking. Contact the vendor for more information on enterprise pricing packages. Organizations looking for a sizeable discount can opt for a one-time fee, while special discounts are also available for not-for-profits. We realize that when you make a decision to buy Landing Page Software it’s important not only to see how experts evaluate it in their reviews, but also to find out if the real people and companies that buy it are actually satisfied with the product. That’s why we’ve created our behavior-based Customer Satisfaction Algorithm™ that gathers customer reviews, comments and SimplyCast Landing Page Generator reviews across a wide range of social media sites. The data is then presented in an easy to digest form showing how many people had positive and negative experience with SimplyCast Landing Page Generator. With that information at hand you should be equipped to make an informed buying decision that you won’t regret. What are SimplyCast Landing Page Generator pricing details? What integrations are available for SimplyCast Landing Page Generator? Simply Cast Landing Page Generator integrates with the following business systems and applications. If you need more information about SimplyCast Landing Page Generator or you simply have a question let us know what you need and we’ll forward your request directly to the vendor.